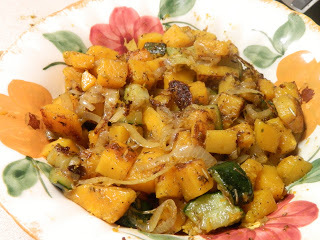 Enjoy this low carb, gluten free side dish. It's wonderful for special occasions or a holiday dinner especially. Have all of your ingredients nearby and ready to place in the pan. Place butter in large non-stick saute pan. Melt butter and continue to heat while swirling until butter just begins to turn brown. It can burn very quickly so you need to watch it closely. 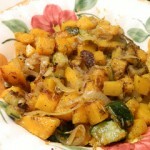 As soon as the butter is browned, dump in butternut squash, zucchini squash, and onion slices. Stir together. Sprinkle in the LC-Natural Sweet Brown, sage, thyme, rosemary, salt and pepper. Stir all together well, coating all with the butter in the pan. Cover, reduce heat to medium low, and cook for 8 to 10 minutes. Uncover and stir. Cover and let cook about 5 minutes longer. Check for tenderness, cover and cook a couple minutes longer. About every 2 minutes or so stir, until vegetables are the tenderness you prefer. The time it takes will depend on how tender you like them. It took me around 15 min. altogether. When they are about done, uncover and let cook about 3 minutes on medium heat, to let them brown on the bottom. Pour out into a serving bowl.